When it comes to improving your accuracy, especially at the range, nothing beats a reflex or red dot sight for your Glock. But which is more effective and which should you choose? In this article, we look at the difference between the two, as well as the best products on the market of the year. ​The reflex sight superimposes a reticle on top of targets, which creates more of a simple, 2D picture that’s somewhat quicker to interpret. Red dot sights present a red dot over your target and are viewed more similarly to traditional iron sights in that regard. ​Reflex sights generally have brightness levels to increase visibility. Red dot sights do not have this feature. ​Generally speaking, reflex sights are larger than red dot sights. ​Reflex sights require more power, and thus, typically have a much shorter battery life than red dot sights. 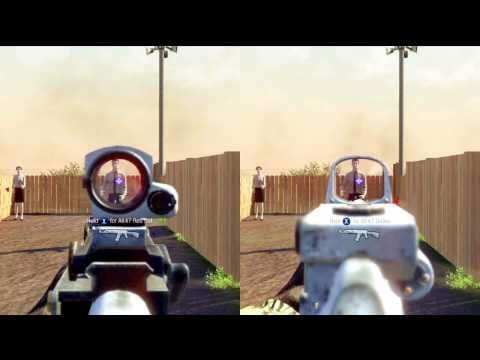 ​Reflex sights typically have a range of reticles. Sometimes, you can choose between several and all are extremely precise. Red dot sights are generally five MOA (minutes of angle) and less precise, although they are a substantial improvement over iron sights. Additionally, red dot sights sometimes have the ability to adjust the MOA, affecting the reticle’s size and thus, precision. ​Lastly, reflex sights can quickly become complex, with a range of features and a shorter battery life, whereas a red dot sight has minimal features and can last for up to 50,000 hours, making it a much simpler (and perhaps reliable) instrument. ​If you’re not careful, it’s easy for a reflex sight to leave you hanging with a dead battery. Red dots are much less likely to do so with regular changing. ​It’s certainly a generalization, but a red dot sight is likely to be easier to adapt to at mid to long ranges, whereas a reflex sight is perfect for any range, including very long range. Consider how far away you plan on shooting to decide which works best for you. ​This has less to do with the decision between the two types of sight and more to do with the fact that both can range from very affordable to extraordinarily expensive. You’ll often get some amazing features with expensive sights, but sometimes you’re paying for a premium brand more so than quality or features. ​Wouldn’t a unit that automatically adjusts the brightness be great? It would if it’s in your budget. Thankfully, many of our choices are affordable and offer great features like this, but be sure to pay attention to them so you can reap the rewards! ​Do you want a triangle? A traditional dot? What MOA makes more sense for you? A pinhead-sized reticle is great for long distance, but may not be appropriate for a lot of close shooting. Now that you’re armed with the knowledge to decide what options are right for you, let’s get down to the best of the best. The products we’ve rounded up are top-performers amongst reflexes and red dots, including both budget and premium-quality builds. You’re sure to find the perfect sight for you as long as you keep our advice in mind. The Burris Fastfire III is an excellent choice for a scope, as it offers auto brightness which works exceptionally well at automatically adapting to any light condition. Of course, you can adjust it yourself to three brightness levels or turn it completely off. Additionally, the unit intelligently remembers your last setting, perfect for those long hunting trips where you want to save battery life between shots. The battery is accessed from the top, by the way, which can be a real pain in the rare gun configurations where changing the battery could require a complete uninstallation. As for the reticle, it is a precise three MOA dot. This will take some getting used to for those accustomed to using sights and may require a couple of sessions, but once you are used to it, your accuracy will be spot on. For this unit, there are no adjustments to be made to the reticle, but it works just fine as it is. Installation is quick and easy and most who know what they’re doing could get it up and running in 15 minutes or less. Additionally, once installed, it is compatible with front iron sights. Burris has also provided the ability to adjust windage and elevation on the fly without the use of tools through simple dials on the side of the unit. It’s worth mentioning that it is also available in an eight MOA variety, and with or without a Picatinny mount. Eight MOA would be more ideal for close range, but all other features remain the same. We’d suggest sticking with three MOA for the greater precision and flexibility in range. Overall, there’s not much to dislike here. We’d be nitpicking, but there is no protective cover. The sight is made from hard tempered glass, so that’s not a problem. But during cleaning, if you splash your sight, you’ll have to clean it, even if you weren’t cleaning your sight itself. It would just be nice to be able to cover it when doing routine work on your Glock to keep it from getting dirty. All in all, it’s a great baseline—but high—standard for sights. It operates smoothly, has auto-brightness, and is easy to install. 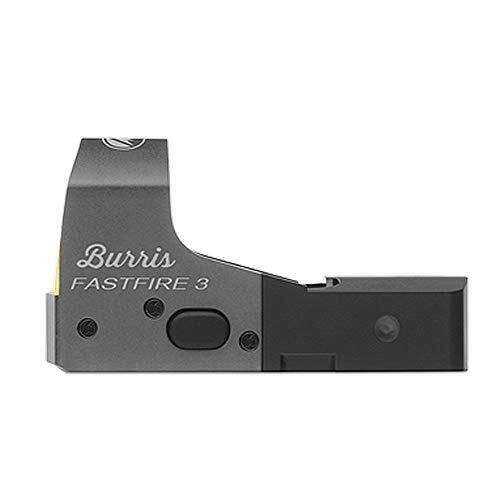 The Burris Fastfire III isn’t the most feature-loaded sight, but it offers everything we’d ask for as a baseline standard and delivers those features with exceptional quality. 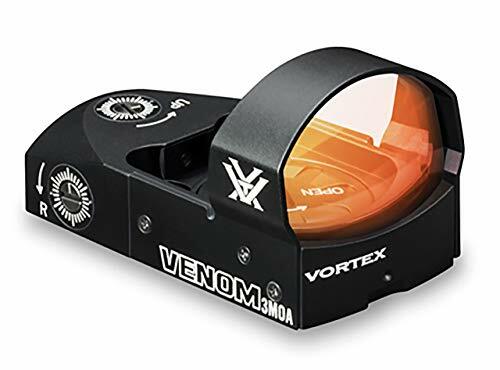 The Vortex Optics Venom Red Dot Sights are very capable sights. Right off the bat, we want to point out that it is designed for any environment, as it is fully waterproofed and can withstand rain, dust, and snow. Additionally, it is sealed against fog and condensation, while the shockproof construction turns it into a veritable tank. An Armortek coating protects the lens from oils and scratches, too. Environmental conditions are further stretched thanks to the ability to adjust between ten brightness levels. Additionally, the Viper High-Density Glass produces exceptional contrast, which is capable of filtering through hazier conditions. Add an auto-brightness setting, and it is a perfect sight for hunting. Picture it like this: you’re out at pre-dawn, with only the faintest ambient light filtering through trees, with half the landscape still blanketed in shadow. The light moisture in the air isn’t noticeable around you, but in the distance, it takes the form of thick, drifting blankets of white. You look through this sight and your picture is as crisp as could be. It truly works like magic. Taking the shot is a piece of cake with a crisp three or six MOA dot. We recommend the three MOA for maximum precision, but the six MOA is fair for those who do more close-range shooting. Additionally, you get tool-free adjustable windage and elevation. Battery life is a solid 14 hours and Vortex Optics estimates it will last 150 hours with the auto shut-off for most users. The battery is accessible from the top. It’s hard to find any downsides here. They’ve even included a protective cover. Our only potential con might be that with performance this great, you’ll want to really stretch your capabilities and may find yourself wishing you had magnification, too. For those who want a premium red dot sight capable of operating like magic in any condition, the Vortex Optics Venom Red Dot Sights are hard to beat without breaking the bank. 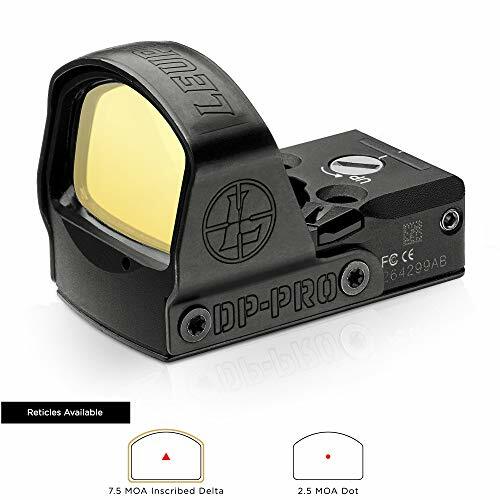 The Leupold Deltapoint Pro is an excellent sight, created to be fully waterproof and fog-proof, with a DiamondCoat abrasion-proof lens. Additionally, it is housed in durable, but lightweight, aircraft aluminum and shrouded by spring steel. As for performance, you get a triangular reticle. This is a specific use case and a matter of taste. 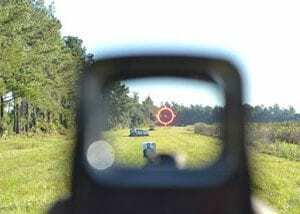 A triangle reticle is ideal for shooting at closer ranges up to about 50 yards. The triangle shape is very quick to draw in the eye, as you’ll automatically focus on the wide base and shift to the precise point. That said, some shooters find that going beyond 50 yards is more suited to a precise dot reticle, while others insist that the triangular precision is better—what matters is what you think, so if you’ve never used a triangular reticle, be aware that it’s a never-ending debate. At any rate, Leupold certainly backs up its short-range game. Included is an optional rear iron sight that dovetails into the housing, allowing co-witnessing. This further enhances short-range accuracy. Motion sensors deactivate the unit after five minutes, helping to save battery life. Additionally, the sensor turns back on when motion is detected. Contrast this to other units which need to be manually reactivated. This very intuitive, although it will drain the battery faster compared to those units. The battery, by the way, is super-easy to access from the top, hidden by a spring-loaded compartment that only requires your fingers to open. Lastly, we appreciate that the Deltapoint Pro works on far more than Glocks. If you decide you don’t want it on your Glock, move it to an AR, shotgun, or whatever else you’d like to improve. Our only potential downside is that it’s a tad on the pricier side, although nowhere near outright expensive. You know we always demand value. 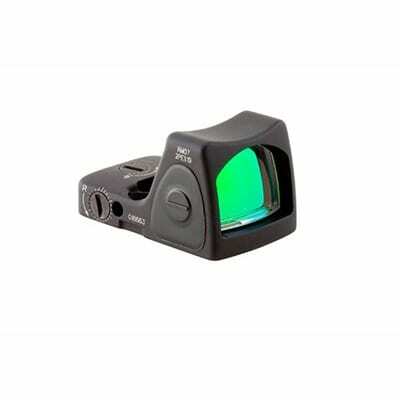 If you’re looking for a quality triangular reticle-based sight, this is what you’ve been looking for. For those who prefer a triangular reticle or versatility in shooting close, the durable Deltapoint Pro is an excellent choice. On a budget? By now, you know that we’ve got you covered. Or more specifically, Ade Advanced Optics has your back with this completely weatherproof and shock and fog-resistant unit that goes the distance for anyone who needs quality without spending a lot. You won’t be sacrificing features here, either. You get a crisp five MOA dot and five illumination settings. This provides a clear picture in any lighting condition. Additionally, the lenses aren’t cheap—they offer precision grounding with no discernable parallax. You get full windage and elevation adjustments, which are lockable, and unlimited eye relief. There are no annoying trade-offs. The battery is loaded from the top and easy to access. Installation is straightforward and each part seems to be of consistently high quality, operating smoothly with the Glock during and after loading up. That said, this is a budget solution. It works beautifully for what it is, but you’re not getting an auto-off feature. Nor are you getting any particularly great enhancement to the picture beyond the adjustable lightness. It also will not automatically find the best lightness setting for you, as you will have to do it manually. In short, you’re sacrificing handholding for a unit that costs a fraction of what others do. We think that’s a more than fair offer. If you’re looking for a budget red dot sight that is still high-quality, durable, and weatherproof, Ade Advanced Optics agrees with us that you shouldn’t have to settle. 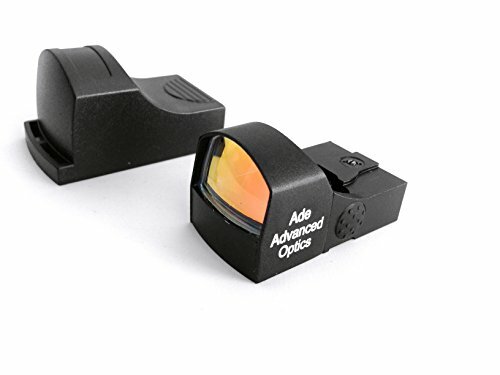 For those on a budget, Ade Advanced Optics provides a red dot sight that maintains high quality standards and performance. For those who demand premium performance, Trijicon is always ready to up your game and you should expect no less from their reflex sight. After all, this is the company that produced ACOG, so you can bet they’ve got some tricks up their sleeves. Let’s start with build quality. As you’d expect, you get a forged aluminum housing that is completely weatherproof. The glass itself is unbelievably clear to the point that even though it’s obviously filtering your view, it seriously looks as though it’s otherwise invisible. That said, it is bullet-proof strong and resists grease and oils. There are eight brightness settings but the automatic brightness works so well that you will likely never use them. The automatic adjustment is seamless and smooth and the eight brightness settings just seem so well-calibrated that you’ll forget there are even gradations to the setting. Additionally, you can easily adjust the brightness of the dot independent of the view, although once again, the automatic function works so well you’ll probably never use it. The dot itself is exceptionally crisp, but it really shines when it’s paired with the auto-brightness settings. Both your view and your reticle are simply perfectly calibrated together to provide maximum clarity. We like a minor innovation, in that the adjustable windage and elevation produces audible clicks. Turn the easy-to-access dial and it produces a very smooth adjustment that you can see and hear. Trijicon is a favorite of law enforcement and the U.S. military and as such, their components are rugged. In testing, this reflex sight holds zero and never flickers over the course of thousands of shots. We’re not suggesting it’s failure-proof, but it’s probably as close as any will come. If you’re willing to spend a little more for a reflex sight that will never let you down and can provide optimum accuracy under any conditions, then rely on Trijicon’s RMR Type 2. Deciding between a red dot sight and a reflex sight for your ideal reticle is something of a lifelong battle, with so many great reasons to choose from the many available options. Our guide offers clarity on the value behind those options and rounds out a list of products that cut through the noise of lesser products. No matter what you choose, you’re sure to take your game to the next level.